Hey y'all! Mandee from The Kitchen Wife here! And I don't know what the weather is like in your neck of the woods, but around here Fall is in full bloom. The wind is blowing, the air is crisp, and the trees are stunning. With autumn among us, that can only mean one thing...Pumpkin season has arrived! 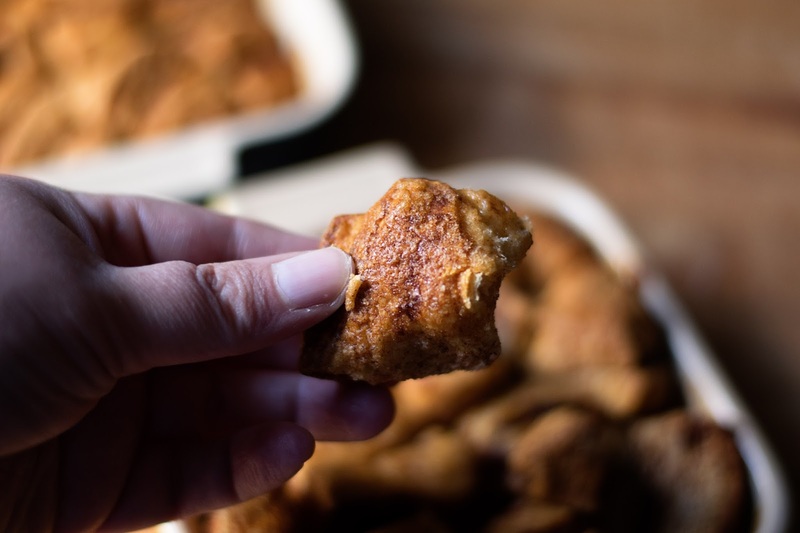 Now I know you've been bombarded with coffee drinks, donuts, and muffins galore, but I promise you that my Pumpkin Monkey Bread takes the heap! Now take the biscuits and cut them into fours and roll them into small balls. Add the dough balls to the resealable bag. Seal the bag (And trust me when I say MAKE SURE IT IS SEALED) and shake so that all of the dough balls are covered with the spice mix. Now it's time to make the glaze for the monkey bread. In a microwave safe bowl add the butter and brown sugar. Place in the microwave until the butter has melted. For this next part you are going to need a bunt pan that is WELL GREASED. I'm talking every nook and cranny! Now a layer of the dough balls. Continue layering until you have run out of dough balls. Pour any of the puree mixture that is left on top and bake for 30-35 minutes in a preheated 350 degree oven. After 30-35 minutes your monkey bread will look like this. My cat knock the monkey bread off of the cake stand and onto the floor, where he stood over it licking away. Instantly I panicked, but then I went to the fridge grabbed the one can of biscuits I had left and made a small batch in these personal sized baking dishes. And there you have it! 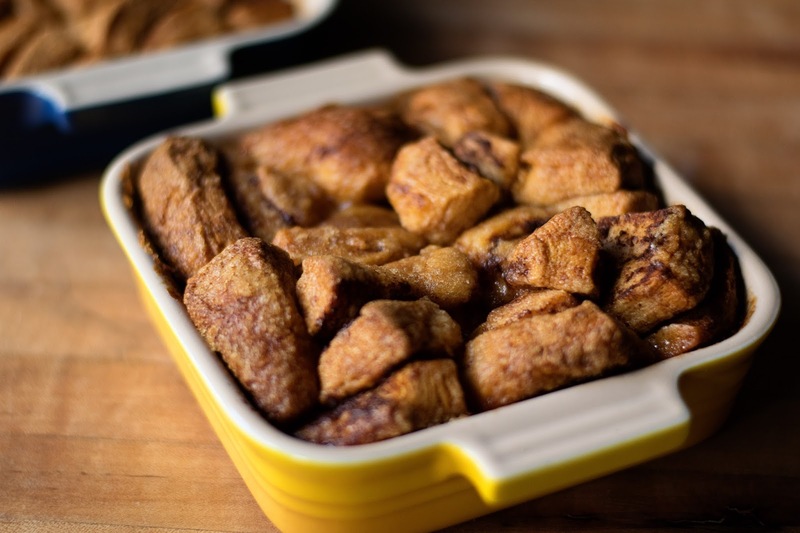 The perfect Pumpkin Monkey Bread. Whether it is beautifully molded from a bunt pan or in a baking dish these sweet, warm, spicy, delightful morsels are the perfect companion to your morning coffee, an afternoon snack, or an evening dessert. And speaking of dessert, pardon me while I dig in! 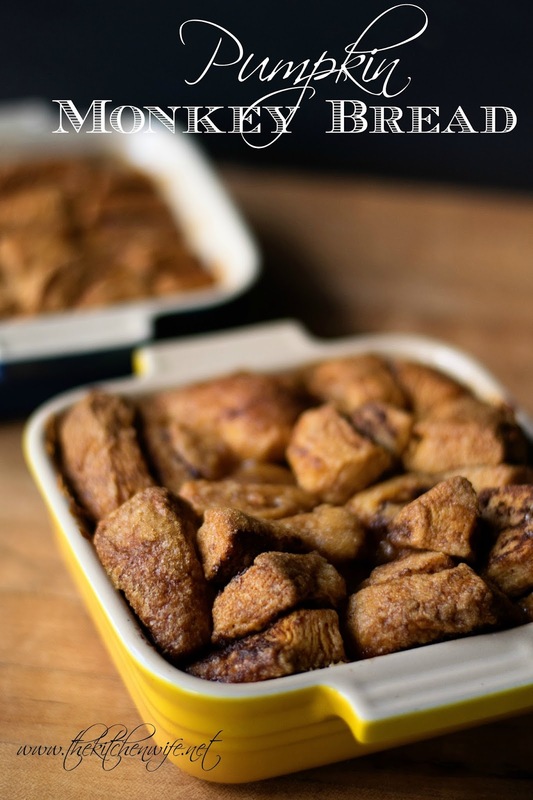 So if you are looking for something heartwarming and easy to make tonight give this Pumpkin Monkey Bread a try. And if you like this recipe check out these great options for fall as well. In a resealable bag add the sugar, cinnamon, nutmeg, ginger, and clove. Cut the canned biscuits into fours and roll them into balls. Seal the bag and shake so that the dough balls are covered with the spices. In a mixing bowl add the butter and brown sugar. Microwave until the butter is melted. Add the pumpkin puree to the butter mixture along with a pinch of salt. Whisk the puree mixture until smooth. In a greased bunt pan pour a little of the pumpkin puree in the top. Then place a single layer of dough in the pan. Continue this process until you have run out of dough. Pour any extra puree mixture on top and place in the oven to bake for 30-35 minutes. After 30-35 minutes remove from the oven and let rest in the pan for 10 minutes. Place a plate on the top of the pan and flip over.